Workflows that enroll deals and tickets, allowing you to set properties, create tasks, and send email based on those deals and tickets. Workflows has always focused on automating primarily marketing activities and has been centered on contacts. If you’ve ever tried to set up automation for your sales teams related to deals, you’ve probably been frustrated by the limitations these contact-based workflows have when it comes to automating other things in HubSpot. You couldn’t set deal properties, trigger workflows anytime a deal closed, or accomplish many other important types of deal automation. Now when you create a workflow, you’ll see the option to enroll either a contact, ticket, or deal. For example, now you can build a workflow to escalate a ticket if it’s been open for more than 60 days. Similarly, you can build a workflow to advance a deal to the next stage automatically, or create tasks for your reps whenever deals enter certain stages. 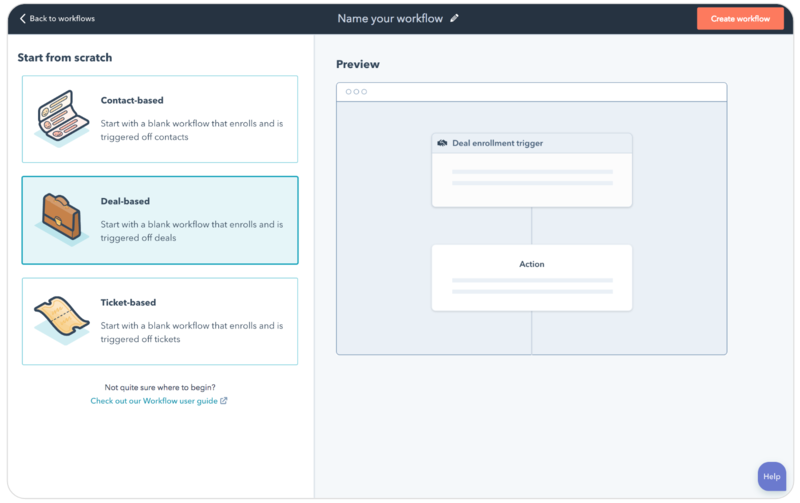 Go to Workflows, create a new workflow, and you’ll see new options to create deal- and ticket-based workflows. Once you create one, you can build one out like a regular workflow. For now, the actions available in these workflows are setting properties, creating tasks, and sending email (to send email, you must also have Marketing Hub Professional). We’ll continue adding more functionality to these workflows to match what can be done in contact-based workflows. This update is now live. Deal workflows are available to all Sales Hub Professional users, and ticket workflows are available to all Service Hub Professional users. What language is it in? This update is available in all languages supported by HubSpot.